I tend to cut my soaps quite generously with an average weight of 7oz. Ive had a bar that weighed 10oz before. It feels quite substantial to hold and use in the shower especially if used directly on the body. What I do is to cut the bar in half and I find that fits nicely in my palm – much more comfortable to use and psychologically it feels like I’m getting twice as much for my ‘money’. One of the hardest parts of soapmaking is waiting the minimum cold process cure period of 4 weeks. While I tend to try out the lather on my hands after a couple of days/week, I don’t bathe with it till the 4 weeks are over. 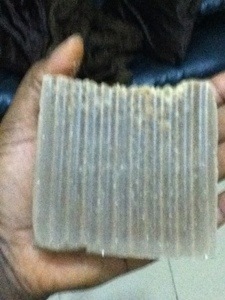 The chocolate scent in this lush soap is quite heady. You’ll either love it or not. Also its something a guy wouldn’t mind using… Like real dark chocolate. The lather was nice and creamy, and the oatmeal contributed a gentle scrub. My skin feels moisturised and soft/smooth. I’ve been feeling my arm all the time I’ve been writing this post. Lovely! I’ve tried the faux funnel pour technique in the past but my recipe moved fast so I ended up improvising. A soapmaker must always have a plan B! This particular soap was originally meant to be a 3 layer colored soap but the batter was nice and thin so I just had to give the FF another shot. This recipe is 100% Coconut oil. The black portion is mixed with Activated Charcoal and the yellow is soap colourant. 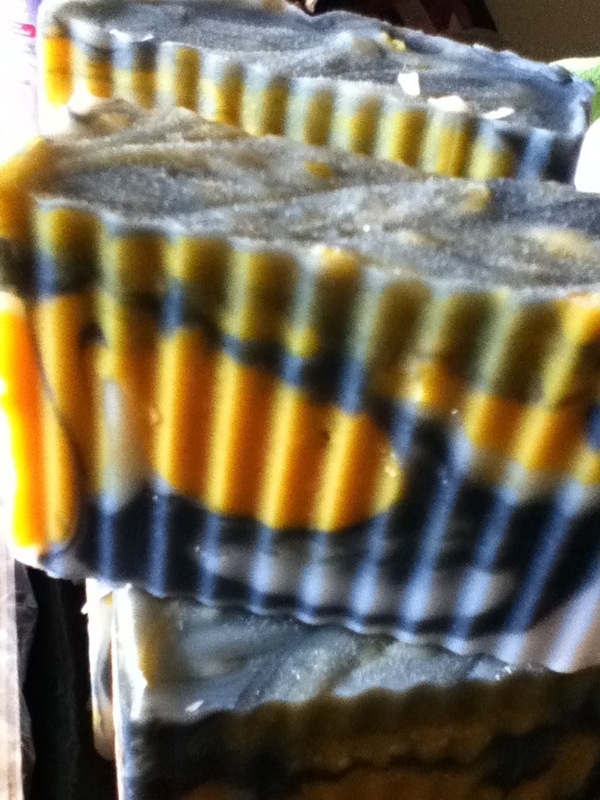 I scented this batch with lemongrass because it works so well with the natural scent of the unrefined coconut oil. I was excited to get this coconut oil soap into the shower today. I ditched the sponge and used it direct because I wanted to feel the poppy seeds. The lather was luxuriously creamy and bubbly. The poppy seed was nice and firm and provided pleasant exfoliation. 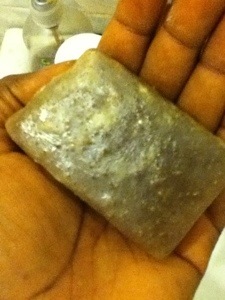 I didn’t moisturize my dry skin afterward just to see the effect of the excess oil in the soap. 12 hours later my skin is not dried out and you wouldn’t know I didn’t use moisturizer if I didn’t say. My face did feel a little taut after the shower but that feeling relaxed within minutes. My oily facial skin has also stood up to the moisturizer free test though I encourage you to keep your skin hydrated no matter what type of cleanser you use. I will definitely be considering this recipe as a staple offering.